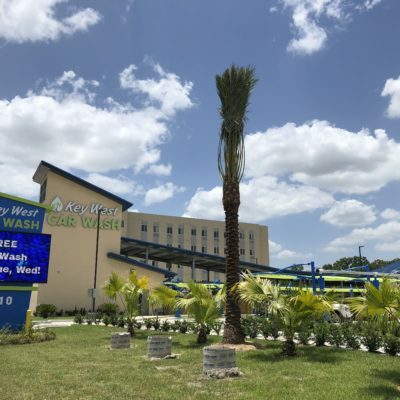 Key West Car Wash was newly constructed in 2017. We offer the most modern and convenient car wash design and amenities with our customers in mind. From the quick-n-easy access and traffic flow to the personal vacuum stalls with custom sun shades to the all-in-one auto mat wash and dry system. Just sit back and relax. Simply pull into our automatic wash tunnel and let our system wash and protect your vehicle. It’s quick and easy, we are equipped to care for 150 vehicles per hour. All wash packages also include free access to a self-serve industrial-strength vacuum, mat wash-n-dry system, and dash air duster. When you wash your vehicle at Key West Car Wash you are not only getting a clean, shiny, dry vehicle, but you are also protecting the environment. Listed below are some of the reasons why we are the #1 Green car wash.
Water use– We use a fraction of the water that home washers use. In fact, home washers can use up to 140 gallons of water, while washing at Key West Car Wash only uses approximately 30 gallons of water per vehicle. Recycled water– We reclaim and filter all of our fresh water for re-use. This recycling process allows us to save about 20 gallons of fresh water for each wash.
Water treatment– Water that is not re-used is processed before being sent to sanitary sewer systems for further refinement and processing. Washing at home sends all the corrosive and potentially toxic substances that are on your vehicle and on the street – asphalt, engine and brake residue, antifreeze, grease, rust, and oil – into the public storm drain system where it is eventually released into our areas rivers and streams. Safe cleaning products– Our cleaning products are eco-friendly and biodegradable. So, you, your vehicle, and the environment are not exposed to any harmful chemicals. Washing your vehicle at home can release chemicals that are harmful to fish and wildlife. Central collection– We have a central collection system for all the dirt and grime that accumulates on your vehicle. We collect and re-direct it to facilities that can properly handle this non-hazardous waste. When vehicles are washed at home, the dirt and grime is carried into storm drains designed to handle rainwater. This can clog the drains and prevent them from working properly when it rains. At Key West Car Wash, we know how important your vehicle and its finishes are to you. That’s why soft-touch technologies, including Hodge’s professional-grade brushes, that research has proven is far superior to hand washing and much gentler on your vehicle’s finishes. 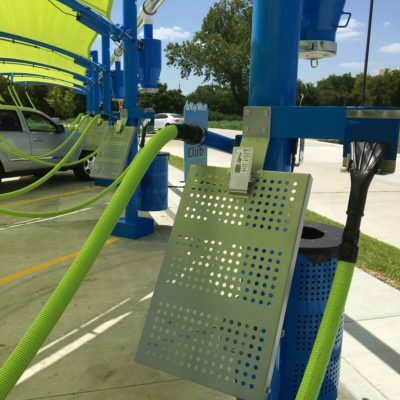 The International Carwash Association, working through a special Carwash Research Foundation Grant to the University of Texas at Arlington, Texas, conducted extensive car washing tests to determine the effect on car finishes by comparing various car washing techniques ranging from professional car washing to the bucket and sponge used by many auto owners. They found that hand washes are extremely harmful to automobile finishes. Tests showed that a single home hand wash on an automobile can produce scratches that penetrate as deep as 1/10 of the total thickness of the automobile’s paint. Their test findings substantiated those done by the Technical University of Munich, Germany, in association with Mercedes-Benz, which showed that similar damage was done to an automobile when using detergent, low water volume commonly found in hose nozzles at home, buckets of water, sponges and towels used in the average home car washing. The University of Texas’ tests also showed that hand car washing can produce so many marks on a car’s finish that they cannot even be counted. Further, their tests showed that in all hand washing temperatures, surface reflectance readings steadily declined, with some hand washing techniques being considerably worse than others. 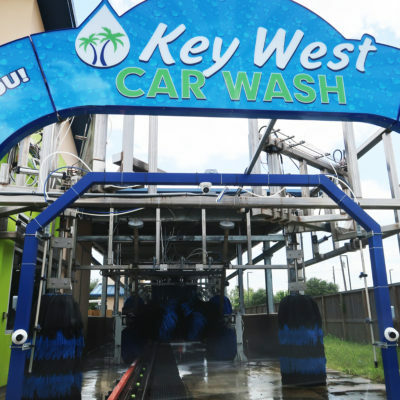 By contrast, when cars were washed by professional full-service car washes, like Key West Car Wash, there was virtually no change in the surface reflectance or shine readings.